"When issued" shares don't actually exist yet. 3. What Does the Fifth Letter of a Stock Symbol Mean? While scrolling through the stock quotes, you may come across a ticker symbol that seems a bit longer than usual. This happens when a stock is trading under special circumstances – the company is about to split its shares, for example, or is under bankruptcy protection. The symbol V means "when issued or when distributed" on the NASDAQ exchange, and it indicates that a company's shares are trading even before they're issued. The V means you're looking at a virtual stock – only a promise of future profit. On the NASDAQ exchange, the letter "V" after a four-letter ticker symbol for common stock is a future reference of "when issued or when distributed." Companies that trade on the NASDAQ exchange have four-letter ticker symbols, but sometimes you'll see a fifth letter appending the four letters. This fifth letter is an "identifier," because it offers investors a little more information about the company offering the stock. Even though the letter "V" is an identifier that technically means "when issued or when distributed," its practical translation means a company's shares may be on the verge of a split. Different exchanges use different abbreviations; the small v appended to your ticker symbol is used on the NASDAQ exchange. The corresponding symbol on the New York Stock Exchange is WI, for "when issued." Don't confuse the small "v" for the capital "V" that indicates a stock traded on the Vancouver Stock Exchange. On this remote Canadian bourse, stock tickers are one to three characters long, preceded by a capital V and a period. A when-issued stock has yet to see the light of day. The official day of issuance is a few business days off, and for a brief period you can trade in shares without being able to settle for a profit or a loss. It's common for treasury bonds to trade on a when-issued basis, as speculators guess at the rise or fall of the bonds on the day they actually come up for auction. 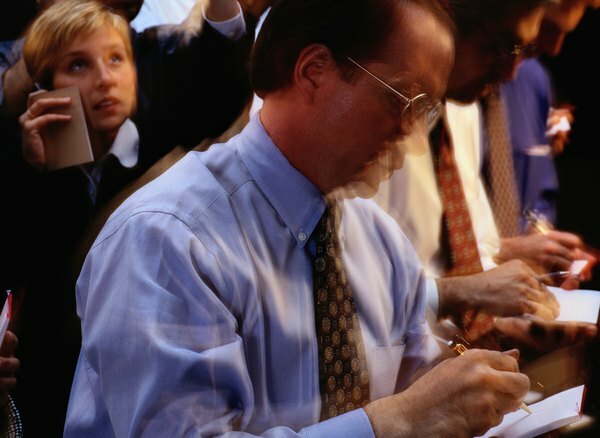 With stocks, when-issued trading only takes place when there is widespread interest and demand for the stock. When-issued trading has benefits for public companies, brokers and experienced traders. Instead of waiting for the day of issuance and hoping for the best, a broker or trader can look at the when-issued pricing of the stock to get a feel for how the market will respond. If when-issued trading results in a price lower than the target price, then a broker or trader can adjust her strategy or stay out of the stock altogether. A rising price on a when-issued stock reveals higher-than-expected public interest. When-issued trading is for speculators only. You shouldn't be making a long-term investment in a stock until it has spent some time trading in the real world, and you have a chance to see how it performs in up and down markets. Needless to say, WI stocks don't pay dividends, and WI bonds don't pay interest, and you can't actually settle the trade until the security exists. This means risk with potentially no reward if the market turns against you before the big day arrives. Investopedia: What Are the Fifth-Letter Identifiers on the Nasdaq?